BACKGROUND AND PURPOSE: Subdural hemorrhage (SDH) is often associated with infants experiencing nonaccidental injury (NAI). A study of the appearance and natural evolution of these birth-related hemorrhages, particularly SDH, is important in the forensic evaluation of NAI. The purpose of this study was to determine the normal incidence, size, distribution, and natural history of SDH in asymptomatic term neonates as detected by sonography (US) and MR imaging within 72 hours of birth. MATERIALS AND METHODS: Birth history, delivery method, duration of each stage of labor, pharmaceutic augmentation, and complications during delivery as well as postnatal physical examination were recorded. Brain MR imaging and US were performed on 101 asymptomatic term infants at 3–7 days, 2 weeks, 1 month, and 3 months. Clinical follow-up at 24 months was recorded. RESULTS: Forty-six neonates had SDH by MR imaging within 72 hours of delivery. SDH was seen in both vaginal and cesarean deliveries. All neonates were asymptomatic, with normal findings on physical examination. All 46 had supratentorial SDH seen in the posterior cranium. Twenty (43%) also had infratentorial SDH. US detected 11 of the 20 (55%) infratentorial SDHs and no supratentorial SDH. Most SDHs present at birth were ≤3 mm and had resolved by 1 month, and all resolved by 3 months on MR imaging. Most children with SDHs had normal findings on developmental examinations at 24 months. CONCLUSION: SDH in asymptomatic term neonates after delivery is limited in size and location. The purpose of this study was to determine the normal incidence, size, appearance, and distribution of SDH in asymptomatic term neonates as detected by US and 1.5T MR imaging within 72 hours of birth. In addition, we prospectively studied the natural history of these hemorrhages. This study can then serve as a baseline for comparison with an abnormal pattern of SDH seen in abuse. The protocol was approved by the Scientific Review and Human Use Committees of the hospital. Neonates of at least 37 weeks gestation, with normal findings on neonate physical examination by a board-certified physician were eligible for the study. The first 101 patients whose parents gave written consent during the approved study period were included. Birth history, delivery method, duration of each stage of labor, pharmaceutic augmentation with oxytocin, and complications during delivery were recorded. All neonates had normal findings on neurologic examination by a board-certified child neurologist before imaging. Ophthalmologic examination of the retina was not performed on any neonates. The first MR imaging and US for each patient were performed at <72 hours of age. US was performed on an Acuson Sequoia 512 (Siemens Medical Solutions, Malvern, Pa) by using 8V5 and 15L8 transducers. Standard coronal and sagittal images of the neonatal brain through the anterior fontanelle and images of the posterior fossa via the mastoid fontanelle were obtained. Color Doppler flow imaging was also used when the findings of gray-scale imaging were positive for SDH. US was performed within 1 hour of the MR imaging. 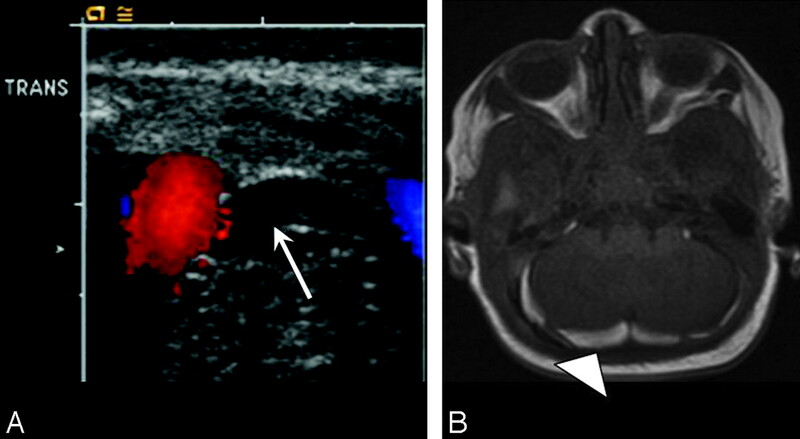 SDH was defined as an extracerebral curvilinear echogenicity subjacent to the calvaria without evidence of central traversing vessels on color Doppler imaging. Imaging was timed to occur after a morning feeding. Infants were transported to the radiology department in a mobile bassinette, placed on the MR imaging table in an 8-channel head coil, and secured with a sheet, sponges, and tape to minimize motion. Pieces of standard foam ear protection were taped in place, and a pacifier was offered for comfort. No infants were given sedation medications. With a Signa 1.5T MR imaging scanner (software 11.0_M4_0403a) (GE Healthcare, Milwaukee, Wis), we used the following imaging sequences: 1) 3-plane localizer; 2) sagittal T2 single-shot fast spin-echo (SE) 2D pulse sequence imaging option with a TE of 90, TR of 3000, bandwidth of 31.25, FOV of 18, section thickness of 4, 0 skip, matrix of 256 × 192, frequency signal intensity, NEX 1, phase FOV of 0.70; 3) axial multiplanar gradient recall (MPGR) pulse sequence gradient-echo imaging option, flow comp, VBW, with a TE of 20, TR of 355, flip angle of 20°, bandwidth of 15.63, FOV of 18, section thickness of 4, 0 skip, matrix of 256 × 192, frequency AP, NEX 1, phase FOV of 0.75; 4) axial T1 conventional SE 2D pulse sequence imaging option, VBW, TE min, TR of 377, bandwidth of 15.63, SAT I, FOV of 18, section thickness of 4, 0 skip, matrix 256 × 192, NEX 0.75, phase FOV of 0.75, frequency AP; 5) coronal T1 (posterior fossa) 2D pulse sequence SE imaging option, VBW, TE min, TR of 502, bandwidth of 15.63, SAT I, FOV of 18, section thickness of 4, 0 skip, matrix 256 × 192, frequency direction S/I, NEX 0.75, phase FOV of 0.75; 6) axial fluid-attenuated inversion recovery (FLAIR) 2D pulse sequence IR imaging option, tailored radio-frequency fast, zip of 512, TE of 120, TR of 10,000, TI of 2200, bandwidth of 15.63, FOV of 18, section thickness of 4, 0 skip, matrix 256 × 224, frequency direction A/P, NEX 1; 7) axial diffusion-weighted echo-planar imaging (DWI EPI) 2D SE imaging option (DIFF), number of shots 1, TE min, TR of 10,000, DWI screen b-value of 1500, diffusion direction ALL, frequency of 128/128, NEX 1, FOV of 18, section thickness of 44, 0 skip, matrix 128 × 128. Conventional SE T1 was substituted for fast SE after 42 patients were scanned. MR and US images were independently reviewed on a PACS (Centricity; GE Healthcare) by 2 board-certified radiologists each with a Certificate of Added Qualification in neuroradiology or pediatric radiology. The child neurologist discussed imaging results with parents. Infants with SDH detected on initial imaging were scheduled for follow-up MR imaging and US examinations at 3–7 days, 2 weeks, 1 month, and 3 months or until the MR imaging and US findings were both negative. If the initial US findings were normal, no further US images were obtained. Final interpretations regarding the presence of SDH on MR imaging were determined by consensus of 2 of the radiologists based on SDH seen on both the immediate postdelivery initial MR imaging and the first follow-up at 3–7 days. 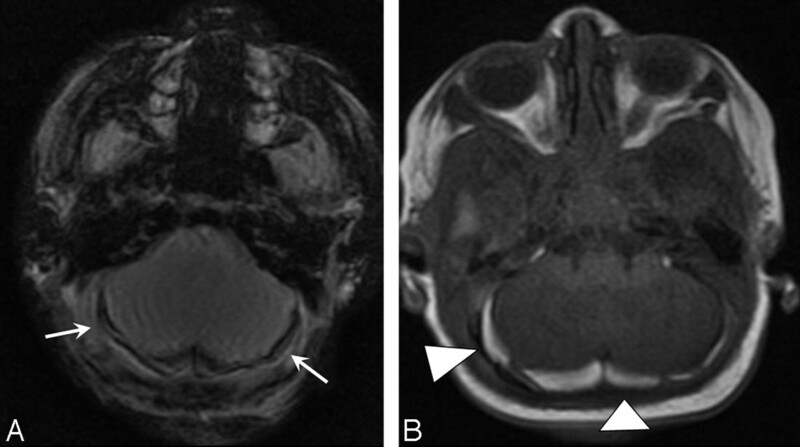 SDH on MR imaging was defined as an extracerebral curvilinear signal-intensity abnormality corresponding to blood products that did not extend into the sulci. For US and MR imaging, SDH location and size were recorded, with size measured as a maximal width in the axial plane by using electronic calipers. In infants with SDH in multiple locations, the size of the largest SDH was recorded. The presence of cephalohematomas was also recorded. Evaluation for coagulopathy was not routinely performed. Comparison of the incidence of SDH among the delivery groups was made by using the Fisher exact test. The average labor times and birth weights of those with SDH and those without were compared by using a Student t test or the nonparametric Wilcoxon test if the variance in data was unequal between groups. The Fisher exact test was used to compare prolonged duration of labor and incidence of cephalohematoma in those with SDH versus those without. The comparison of the incidence of SDH in vaginal and cesarean deliveries augmented with oxytocin administration was also performed by using the Fisher exact test in addition to computation of the odds ratio of increased SDH associated with giving oxytocin. Data are expressed as mean ± standard error of the mean and/or as a median within the range of values obtained. For all tests, a value of P < .05 was considered significant. The first stage of labor was defined as the duration from the onset of labor until the fetus was engaged in the birth canal. The second stage of labor was defined as the duration of fetal descent through the birth canal. One hundred one patients were enrolled in the study between January 2005 and March 2006. There were 58 male and 43 female infants. Seventy-nine (78%) infants were born via vaginal delivery with (80%) via spontaneous delivery (SVD), 10 (12%) with vacuum assistance, and 6 (8%) with forceps assistance (supplemental on-line Table). Thirty-five vaginal deliveries were induced or augmented with oxytocin. Twenty-two (22%) infants were delivered via cesarean delivery: 13 elective cesarean deliveries and 9 for failure to progress and/or fetal distress after a trial of labor. Four of the cesarean deliveries had a trial of labor augmented with oxytocin. One cesarean delivery was assisted with forceps, and 1 was assisted with vacuum extraction. All neonates had normal findings on neurologic examinations at birth. All 101 initial MR imaging examinations were successful, without significant motion artifact. Most infants slept through the entire examination. Examination times required <10 minutes to complete. Three MR imaging examinations were thought to be positive for SDH on initial sequences, but the findings were normal at the first follow-up MR imaging by 3–7 days of life. These were presumed to be false-positive findings and were recategorized as negative findings. Forty-six (46%) infants had SDH on initial MR imaging that was confirmed on follow-up studies (supplemental on-line Table). Forty-four of 46 (95.9%) had SDH of ≤3 mm in thickness (range, 1.0–4.3 mm; mean, 2.1 mm). SDH was best visualized on the initial MR imaging MPGR sequence performed before 72 hours of life (Fig 1). All 46 patients with intracranial hemorrhage had supratentorial SDH confirmed on 2 imaging planes on follow-up imaging. All supratentorial SDHs identified within 72 hours postdelivery were seen in the posterior half of the cranium. Twelve (26%) infants had SDH noted in only 1 location, whereas most infants had SDH in 2 or 3 locations. In all, SDH was most commonly seen in the posterior interhemispheric fissure (parafalcine location) (30, 65%), with SDH also noted posteriorly along the occipital lobes in 29 (63%) and over the tentorium in 22 (48%) (supplemental on-line Table). All SDHs were homogeneous in signal intensity on all sequences. Posterior fossa SDH in a neonate delivered via SVD. A, Axial MPGR at <72 hours of life demonstrates lobular symmetric low signal intensity with blooming in the posterior fossa (arrows). B, Follow-up T1 images show high-signal-intensity SDH (arrowheads) by 7 days. Twenty (43%) of the neonates with supratentorial SDH also had posterior fossa SDH (Fig 2). No neonate had only posterior fossa hemorrhage detected by MR imaging. No neonate had MR imaging evidence of subarachnoid, epidural, or intraparenchymal hemorrhage. No parenchymal contusions were seen. Two neonates had grade I germinal matrix hemorrhages (1 unilateral, 1 bilateral) as well as SDHs. Twenty-two neonates had a cephalohematoma noted at MR imaging. Eighteen (82%) of these neonates had SDH. Most (11/18, 61%) had posterior fossa SDH as well as supratentorial SDH. One had a 1.6-cm paraventricular mass incidentally detected on MR imaging, which was not seen on repeat US performed after the initial MR imaging. The mass, thought to be a hamartoma, was observed with expectant management. It remained asymptomatic and unchanged in size on 4-month follow-up at our institution before the patient's family moved from our area. Neonate delivered via SVD with both supratentorial and infratentorial SDH. A and B, Initial examination shows the lobular occipital SDH to be very low signal intensity on MPGR (arrows, A) and isointense to gray matter and difficult to detect on the SE T1-weighted MR image (B). C and D, Five-day follow-up shows high T1 SDH (arrowheads) in 2 locations in 2 planes, axial supratentorial (C) and coronal, both supra- and infratentorial (D). E and F, Two-week follow-up shows complete resolution of hemorrhage on T1 images. Posterior fossa SDH was seen at US in 11 (11%) neonates, and all SDHs were confirmed on MR imaging (Fig 3). Thus, only 55% of the 20 posterior fossa SDHs seen on MR imaging were identified independently on US examination. US was focused along the lateral aspects through the mastoid fontanelle. Sensitivity of US detection of posterior fossa SDH improved when the 3 infants with posterior fossa SDH isolated to midline were excluded on MR imaging3; thus, 11/17 (65%) lateral posterior fossa SDHs were detected on US. All SDHs seen on US were also seen on MR imaging. No supratentorial hemorrhages were detected at US. Neonate delivered via SVD with posterior fossa SDH seen on US and confirmed on MR imaging. A, Axial sonogram of the posterior fossa through the mastoid fontanel demonstrates initial curvilinear echogenic focus adjacent to the transverse sinus (arrow). B, Axial T1-weighted MR image confirms high-signal-intensity posterior fossa SDH (arrowhead) on day 7 of life. The incidence of SDH versus mode of delivery is shown in Table 1. All 4 neonates with SDH delivered by cesarean birth had supratentorial SDH only. One of the neonates with SDH and delivered by cesarean birth was born via elective cesarean delivery for macrosomia, whereas 3 of 4 (75%) neonates with SDH and delivered by cesarean birth had failed a trial of oxytocin-augmented labor before cesarean delivery. One of these cesarean deliveries required vacuum assistance. In comparison with the neonates delivered via cesarean delivery, rates of SDH were significantly higher in all the vaginal delivery groups (Table 1). There was no statistically significant difference in the presence of SDH in each of the vaginal delivery groups. The duration of the first and second stages of labor was recorded for all neonates delivered vaginally. For neonates with SDH, the mean duration of the first stage of labor was not significantly different from that in those without SDH (Table 2). The second stage of labor was significantly longer in neonates with SDH than in those without SDH. A prolonged second stage of labor (>2 hours) was also significantly longer in the group with SDH, compared with the group without SDH. The incidence of cephalohematoma was greater in neonates with SDH than in those without SDH. There was no difference in average second-stage labor duration in those with a cephalohematoma compared with those without. The mean birth weight of neonates with SDH on MR imaging was higher than that of those with normal findings on MR imaging (Table 2). The overall incidence of SDH in the 39 patients who received oxytocin was not different from the incidence of SDH in the 62 patients who did not receive oxytocin (Table 3). This was also true for the subgroup of vaginal deliveries. However, closer examination of cesarean delivery revealed that the incidence of SDH when oxytocin was given before cesarean delivery was much higher (Table 3). Follow-up imaging was completed in 18/46 (39.1%) patients with SDH. All 18 patients demonstrated resolution by 3 months. Two patients were only imaged at birth and at 3 months due to scheduling conflicts. Both of these patients had normal MR imaging findings at 3 months. Fifteen of 16 patients (93.8%) whose follow-up imaging included a 1-month MR imaging had interval resolution of their SDHs. One patient had a new frontal SDH on the 2-week MR imaging follow-up examination (Fig 4). This patient had bilateral occipital and posterior fossa SDH on initial imaging at birth, confirmed on the 7-day follow-up MR imaging. He was also noted to have extra-axial collections of infancy. At 26-days postnatal age, the MR imaging demonstrated left frontal subdural collections that did not conform to CSF signal intensity. Of the 46 infants with SDH, 43 children had records of 2 years of well-baby examinations at our institution. One child was only followed to 2 months, 1 child's family had moved out of the area, and 1 child was not eligible for continued care in our system. None of the 43 infants had gross motor delay. Six (14%) children were noted to have speech delay, and 1 (2%) is currently being evaluated for an autistic spectrum disorder. Images obtained at 7 and 26 days postnatal age for follow-up of bilateral occipital SDH in a neonate with extra-axial collections. Axial T2, T1, gradient-refocused echo (GRE), and FLAIR images (left to right, top row) show CSF-intensity frontal subarachnoid collections that were present since birth. Also note a thin linear T1 hyperintense GRE hypointense bilateral posterior occipital SDH. At 26 days postnatal age (bottom row), left frontal subdural collections that do not conform to CSF signal intensity are present, consistent with spontaneous SDH. The patient had no history of trauma and had a negative evaluation for NAI. We confirmed reports that SDH occurs in the asymptomatic neonate after delivery.20–22 The incidence of SDH (46%) is significantly higher in our study than in previous reports. Our higher incidence may be related to improved detection and increased sensitivity with a higher magnetic-field-strength 1.5T MR imaging scanner. Whitby et al,20 by using a low-field-strength 0.2T magnet, reported an SDH incidence of 8% overall and 10.5% in vaginal deliveries when they imaged within the first 48 hours of life. Our reported incidence is most like that of Holden et al,21 who, in a pilot study also using 1.5T MR imaging in 1999, saw SDH in 4 of 8 (50%) asymptomatic neonates in the first 4 days of life. These results suggest that SDH after uncomplicated vaginal delivery is a common finding on MR imaging. Patient age at the time of MR imaging is an important factor in determining the incidence of SDH in neonates. We imaged neonates within the first 72 hours of life and found SDH most readily detectable on a gradient-echo sequence, confirmed on follow-up T1 sequences at 3–7 days of life. Most of the SDHs resolved by 4 weeks. Whitby et al20 also found that their 9 patients with SDH first seen within 48 hours of life had resolution of hemorrhage on MR imaging at 4-week follow-up. Recently, Looney et al,22 by using 3T MR imaging, reported SDH in 26% of neonates delivered vaginally. Infants in this study were scanned between 1 and 5 weeks of age. We agree that the true incidence in the population of Looney et al may have been higher than the prevalence reported because they may have missed SDHs that were present earlier in life and had resolved by the time of first imaging. Patient age at the time of MR imaging may also be important in determining an etiology for neonate SDH. In our patients, not only were most SDHs resolved by 1 month but SDHs had resolved by 3 months in all patients. This information may be useful to the radiologist asked to comment on the etiology of SDH in an infant. Our study suggests that SDH in an infant older than 3 months of age is unlikely to be birth-related regardless of the mode of delivery. Proposed mechanisms for SDH have included tears of the falx and tentorium or bridging cortical veins secondary to stretching,11 difficult delivery,26,27 or abnormal labor.19 One suggested mechanism of hemorrhage after vaginal delivery is that increased circumferential pressure and squeezing of the head in the birthing canal result in overlap at the sutures, mechanical compression, and shearing of the bridging veins during delivery, resulting in SDH.28 The true etiology remains unknown because there is a paucity of evidence-based literature on this subject. Most reports of SDH in the neonate appear in the larger body of literature on infants who present with symptomatic SDHs. The forensic literature suggests that SDH can result from rupture of bridging cerebral veins; however, it is difficult to demonstrate rupture of bridging cerebral vessels at autopsy.29,30 Towner et al19 suggested that abnormal labor was a common risk factor for hemorrhage in infants, after a retrospective review of deliveries in nulliparous women demonstrated a low incidence of intracranial hemorrhage. Pollina et al27 suggested that the method of assisted delivery rather than the urgency of the delivery or dysfunctional labor is a more important variable in cranial birth injuries. Although all types of intracranial hemorrhage were more common in vacuum extraction, not all term neonate SDHs can be explained by circumferential head squeeze and overlapping sutures. This finding is particularly true because we found SDH after cesarean delivery as well. Perhaps additional forces during parturition are at work contributing to the rupturing of veins and or capillaries. Although most of the asymptomatic SDHs seen at MR imaging and US were in neonates delivered vaginally, 18% (4 of 22) of our neonates delivered by cesarean birth also had SDH. Most infants with SDH delivered by cesarean birth (75%) had a trial of labor with oxytocin administration before the cesarean delivery. This supports the proposal that SDH may be related to labor. Presumably, the neonate experienced labor during oxytocin administration before the decision for cesarean delivery. All previous reports of SDH associated with cesarean deliveries have been in symptomatic infants. Welch and Strand31 reported a series of neonates with a variety of intraparturitional intracranial hemorrhages, including 3 who had SDH and complicated cesarean deliveries either for failure to descend, forceps failure, or fetal distress. Studies reporting the incidence or prevalence of SDH in asymptomatic neonates have not reported hemorrhages in association with cesarean deliveries. The series by Whitby et al,20 using low field strength, did not report SDH after cesarean delivery even when vacuum-assisted delivery was attempted. Most recently, Looney et al22 reported no SDH in 23 cesarean deliveries. The delayed initial imaging at 1–5 weeks could account for the low incidence of SDH detection in that study because most SDHs in our patients resolved by 4 weeks. The only hemorrhages detected were SDH. The location and size of the SDHs were limited. Most SDHs in our neonates were ≤3 mm. There were 2 neonates with an initial SDH >3 mm. One of these neonates had a presumed hamartoma with an occipital SDH measuring 3.3 mm. The other infant had increased extra-axial spaces and an initial occipital SDH of 4.3 mm. 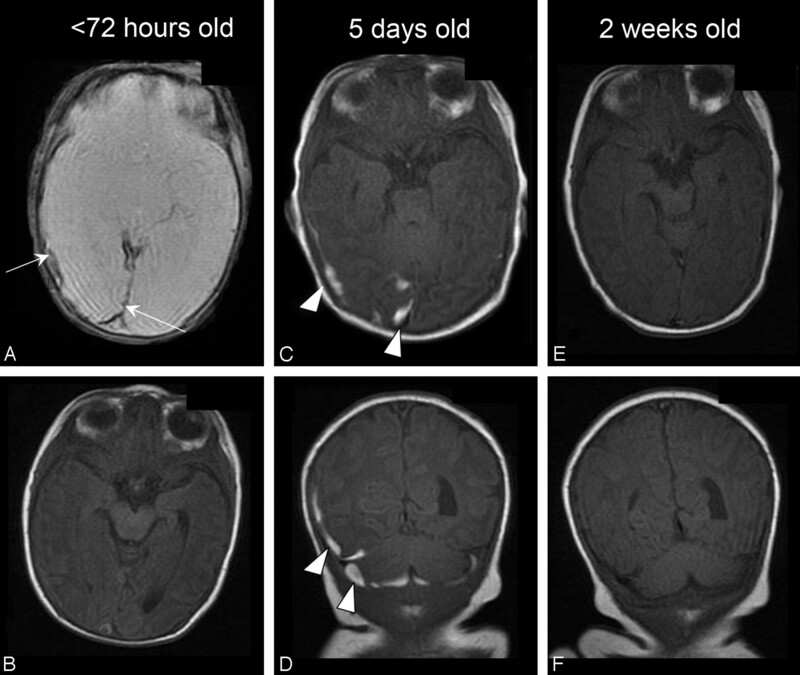 We believe that these infants had factors that may have predisposed them to a larger initial SDH. Like other investigators,20,22 we found most SDHs were in the posterior half of the calvaria. In our patients, supratentorial hemorrhage was more common, with 39% also having infratentorial posterior fossa hemorrhage. Both Looney et al22 and Whitby et al20 reported infratentorial hemorrhage alone being significantly more common. We believe that confirmatory coronal imaging was helpful in assessing supratentorial-versus-infratentorial hemorrhage. Only if we saw the blood products below the tentorium on the coronal view, would we assess the hemorrhage as infratentorial, which is depicted in Fig 2D. This finding was difficult to assess on the initial imaging series obtained within the first 72 hours of life but was confirmed on subsequent coronal T1 imaging. Also very small 1- to 2-mm supratentorial hemorrhages, which were raised as possible SDHs on initial gradient-echo sequences, were not confirmed to be SDH unless found as hyperintense on the T1 follow-up imaging. This finding on 2 subsequent imaging studies may have increased the number of overall supratentorial SDHs that were detected in comparison with that of other investigators. Although SDH along the interhemispheric fissure, parafalcine in location, is widely associated with NAI, we would suggest that the pattern and location of SDH alone should not be used to make a distinction between SDH due to NAI or birth injury. In the pilot study of Holden et al, 21 there is a description and illustration of an interhemispheric SDH in an asymptomatic neonate. The posterior location of the SDH is generally common to reports of asymptomatic SDH, including our study. Interhemispheric SDHs have been previously reported in accidental trauma as well as in birth trauma and are no longer considered specific for the type or mechanisms of injury.36–38 We noted that the SDH was in a more dependent position on follow-up imaging regardless of the location of the initial hemorrhage and propose that this is likely due to the recommended practice of the American Academy of Pediatrics of placing infants on their backs for sleep.39 When lying supine, gravity may account for the posterior locations of the SDH, indicating communication of the subdural space. Although US could detect approximately half of the SDHs, the area imaged was limited to the lateral posterior fossa via the mastoid fontanelle. Midline imaging of the posterior fossa was not routinely performed and thus the utility of US for detection of SDH may have been underestimated. Still, no supratentorial SDHs were detected on US. Clearly, MR imaging is more sensitive than US for the detection of SDH. The 2-year follow-up of the infants with SDH was reassuring because all (100%) of the 43 children with documented follow-up had no gross motor delay. In our study population, 6 (14%) of the children were noted to have speech delay, which is similar to the known incidence in the general population.40 The 1 boy being evaluated for a possible autistic spectrum disorder is not unexpected because autism is currently reported to have a prevalence of 1:150, with the prevalence in boys reported as high as 1:80.41–43 Normal findings on clinical follow-up are reassuring but are limited because there is no baseline for comparison in the study design. We compared normal development with that in children who met the criteria for the Denver Developmental Screening Test, which lists expected milestones at each chronological age through 5 years. This expected development is our norm when assessing children in our clinic. Children not meeting expectations are marked as having a delay and are referred for further evaluation to a subspecialty clinic. One limitation of our study was the evaluation for rebleeding of SDH, which has been reported in the literature. Rebleeding may present either with or without clinical symptoms.44 Although none of our infants re-presented clinically with an SDH rebleed, the subclinical incidence of rebleeding in our population was not studied because none of the infants were reimaged after 3 months of age. Normal development on clinical examination is reassuring, indicating that major rebleeding did not take place. Another limitation in our study included the need to change MR imaging sequences and timing. We found early on that SDH was isointense to gray matter and intermittently difficult to see on initial imaging within the first 72 hours of life. The SDH was seen as lobular low signal intensity with blooming on the gradient-echo imaging. The MR imaging findings were considered positive for SDH if the positive gradient-echo sequence was confirmed on subsequent T1 imaging with hyperintense signal intensity by 3–7 days. To improve MR imaging for maximal sensitivity, we changed the original T1-weighted fast spin-echo imaging sequence, spoiled gradient-recalled (SPGR), to a spin-echo T1 sequence. The initial study performed with fast spin-echo SPGR was recategorized from positive for extra-axial blood products to negative for extra-axial blood products if findings of the follow-up study performed at 3–7 days were negative. The recategorization from positive to negative for SDH may have underestimated the actual number of SDHs in our neonate population. The SDH on initial MR imaging may have been very small and resolved by the second MR imaging between 3–7 days of life. Therefore, the true incidence of SDH may be slightly higher than that reported in this study. The initial follow-up time interval was also changed from 3 days to 5–7 days to account for the signal-intensity conversion changes. The initial follow-up at 3 days did not consistently demonstrate T1 hyperintense signal intensity. We, therefore, lengthened the interval to 5–7 days to allow blood products to change to T1 hyperintense, consistent with methemoglobin. This variability of the time-interval imaging may have masked the actual timeframe in which fetal hemoglobin changes signal-intensity characteristics. Another limitation to the study is the lack of follow-up imaging in some patients. 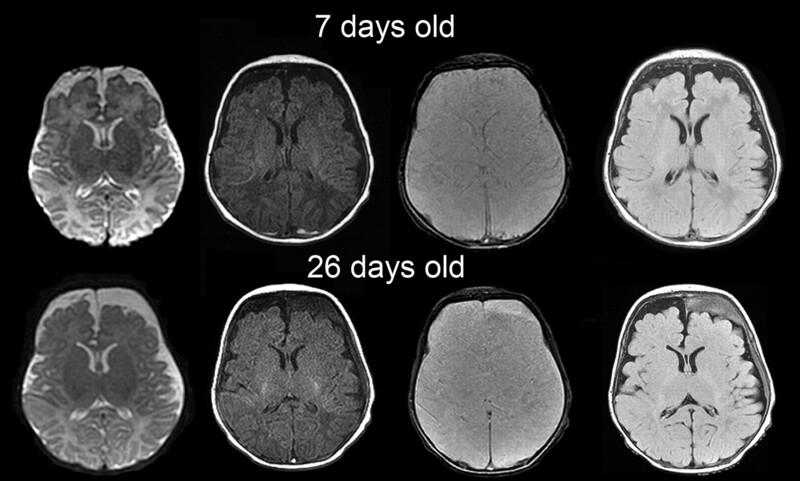 Follow-up imaging was only completed in 18 of 46 infants with SDH. We were surprised to find that, despite the parent knowing that their infant had SDH, follow-up appointments were often missed after the first 2-week follow-up MR imaging and US. Selection bias of the patient population is also a potential limitation. We relied on a random selection process limited by our ability to obtain written consent from the parents for our sample population. SDH is a common result of parturition and may be seen after vaginal and cesarean delivery. MR imaging is more sensitive than US for the detection of SDH. The hemorrhages seen in asymptomatic term neonates are limited in size and location. SDH after 1 month of age is unlikely to be birth-related. We thank Dr. Adam Huillet for recruitment assistance, Tess Schmidt for early morning sonography support, Paul Inuuk and Cindy Lopes for early morning MR imaging expertise, Dr. Kristen Liddell for obstetric knowledge, Drs. Catherine Urethra and John Claybaugh for statistical support, and Dr. Michael V. Krasnokutsky for manuscript review and comments. Previously presented at: Annual Meeting of the American Society for Neuroradiology, April 29–May 5, 2006; San Diego, Calif.
Autism and Developmental Disabilities Monitoring Network Surveillance Year 2002 Principal Investigators; Centers for Disease Control and Prevention. Evaluation of a methodology for a collaborative multiple source surveillance network for autism spectrum disorders: autism and developmental disabilities monitoring network, 14 sites, United States, 2002. MMWR Surveill Summ 2007;56:12–28. Accepted after revision December 24, 2007.